The Southwest Symphony Society orchestra will present its Christmas concert “Do You Hear What I Hear?” at 2:30 p.m. Sunday, Dec. 11, at the Showcase Theater at Seward County Community College, under the direction of Conductor Charles Jeffrey. 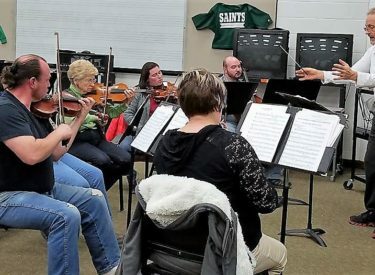 The talented group of local musicians in the orchestra will be joined by the Seward County Community College Choir and the Turpin High School Choir. Admission is a free-will donation and refreshments will be served. Jeffrey moved to the area this summer to be the vocal music instructor with the Turpin, Oklahoma, school system. He has previously taught at the Millwood Arts Academy, and other Okla., public schools. Jeffrey has two bachelor degrees, in music performance and music education, from the University of Nevada-Las Vegas. This concert will also serve as the Southwest Symphony Society’s annual meeting. “Our bylaws require an annual meeting so we like to have one at a concert,” said Burtzloff. “We promise to only take a few minutes to conduct our business. Ensemble members include violins–Bethany Adams, Chris Seeman, Blinda Massa, Nancy Allen; viola-Alison Rice, Nancy Allen; English horn and oboe-Alisa Henderson; flute- Jerilee Rediger; clarinet and saxaphone- Shelly Rowson; clarinet – Brian Smolinski; cello, French horn and trumpet-Troy Skinner; baritone-Elizabeth Denoyer; turba, Josiah Smiddy; and piano and percussion-Donna Apsley. “We are offering a special service for this concert. Audience members can be dropped off at the back door of the Humanities Building and we will have a covered golf cart to ferry the drivers back to door. We don’t want people staying away because of the walk or cold weather,” Burtzloff said.